I am sure you have all heard the saying, “Write what you know.” Most people interpret that to mean, only write about subject matters you are familiar with. 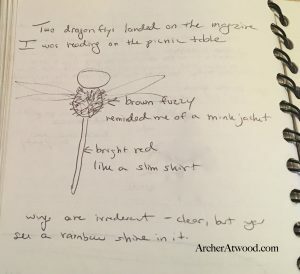 Yes, that does make writing a story easier, but it will not fire your imagination to create something new and different that others will want to hear about. I instead like to think of it as, write about what you have observed and learned today! When I was a kid my Dad would haunt the local library after work. He loved history and would scour the books, magazines, and newspapers for interesting topics and places. Being the youngest, I was brought along. My Dad was of the generation that wasn’t overly concerned about his child’s whereabouts until it was time to leave. Just don’t get in trouble and embarrass him! I would be ditched in the common area to do my homework. Being his child, I instead would sneak off to the dim forest of musty smelling bookcases. It was an old building, like a little castle. I was intrigued by the patterns on the floor, the old architecture, and mostly the upper floors that were dark and quiet. So dark those rows of bookcases were, they had a light switch at the end of each one. The unspoken rule was, you lit your row only long enough to find the book you wanted, then turn off the light putting all those lovely books back into sleep mode. How deliciously mysterious that was to a child. Once my father collected what he needed at the library, he would hum with delight as he plotted out that Saturday’s adventure. Often it included highlighted maps followed by car trips to obscure places like hidden mica mines, haunted tunnels, or a long forgotten battlefield. 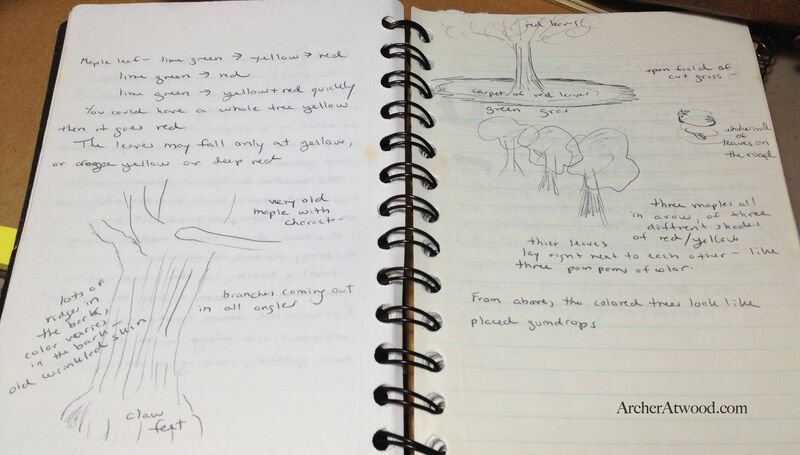 Once the destination was found he recorded what he saw down to the smallest of details. He was also a photographer and would snap a shot or two. My father did that to remember. 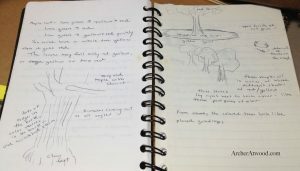 Now how was I able to remember the “dark library forest” experience from all those years back, and be able to tell you about it? Because he taught me to observe and record. He instilled that in me; pay attention, appreciate what you see, feel, and hear. Remember it. And remember it I did, because I often wrote about that library in a sketch journal. 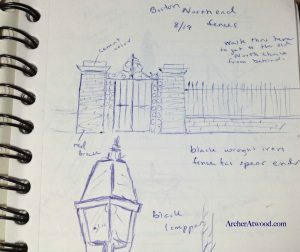 I wrote about everything and tossed down a sketch or two to explain it more, like this random event that happened in my younger life. Take the time to SEE what you are seeing. A fur coat on a bug? That was a pretty interesting comparison. Record observations even if you don’t have a story in mind. Use what ever medium or device is easiest for you. Trust me, down the road you will look back and use these references. I have been asked, what about photos? Can’t you just snap a photo and make that your reference library? I love taking pictures. Another skill learned from my Dad. When I am thinking of a painting, just like he did, I will refer to photos. But with writing, you want a three dimensional “picture” to jump out of the pages. You want your Readers to have the “whole” experience, not a flat one. Yes, take a photo of an interesting place or object, AND jot down notes. 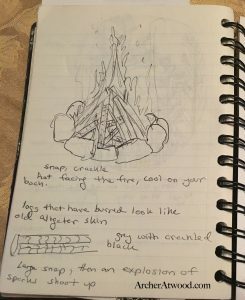 Let’s look at the campfire photo and then the note. In the photo you see different shades of colors. Now look at the notes. 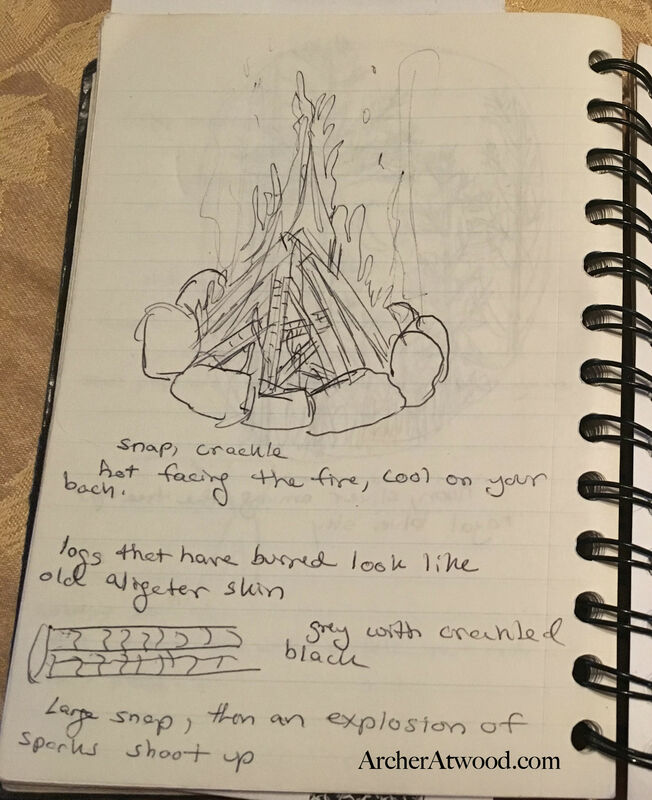 From those notes I will remember later that when you sit looking at a fire your face is warm, but your back is cold. I will remember the sound of crackling wood, the look of the wood as it burns, and what happens when an ember bursts. You can’t get those details from a photo alone. Another example. I have many pictures of pretty ponds, but would I remember that the water plants look like a floating carpet from a distance-that ripples like a shaken out rug? Or that the leaves from a side view are scoop shaped? 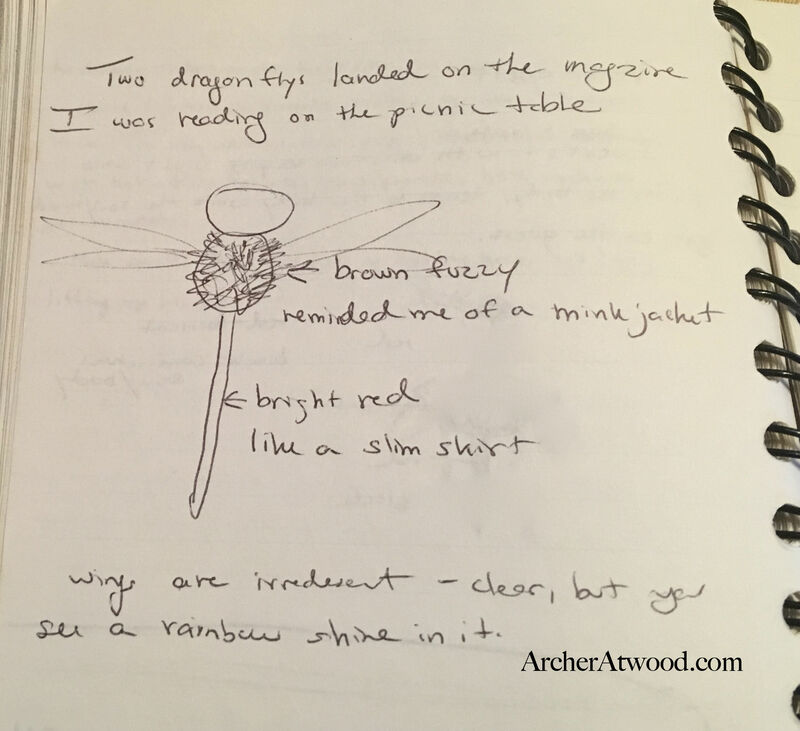 If you combine your photos and your notes…I admit, a photo does have the advantage of helping you remember colors and scale….you will be building your own resource library that is in your own language and style. That will make it easier for you to recall your memories of that time and place, or that object. For practice I would like you to take out your chosen medium to record your thoughts and go into another room and just sit down. First close your eyes and think about the temperature of the room. Is there air moving? How does that feel against your skin? Now open your eyes and write those feelings down. Next pick up the closest object. What does it feel like in your hands? Is it heavy, light? Does your whole hand have to lift it, or can you do it with a few fingers? Is it soft or scratchy? Write all of that down and save it. One day you may need to write about an upset character running off to a room to try and calm down. She may attempt to do that by focusing on the room, or the pillow she grabs from the bed. You will be ready to write the scene because you have notes from your earlier observations. Next step. Get outside! Take a walk in a park, or the country. Settle yourself down and just observe. Make note how wind moves through trees, and how the leaves turn over in response, and how the younger trees move. Reach down and take a handful of leaves into your hands and write down how that texture feels. Describe every bit of it you can, right down to the veins in the leaves. Do they feel brittle or maybe rubbery. 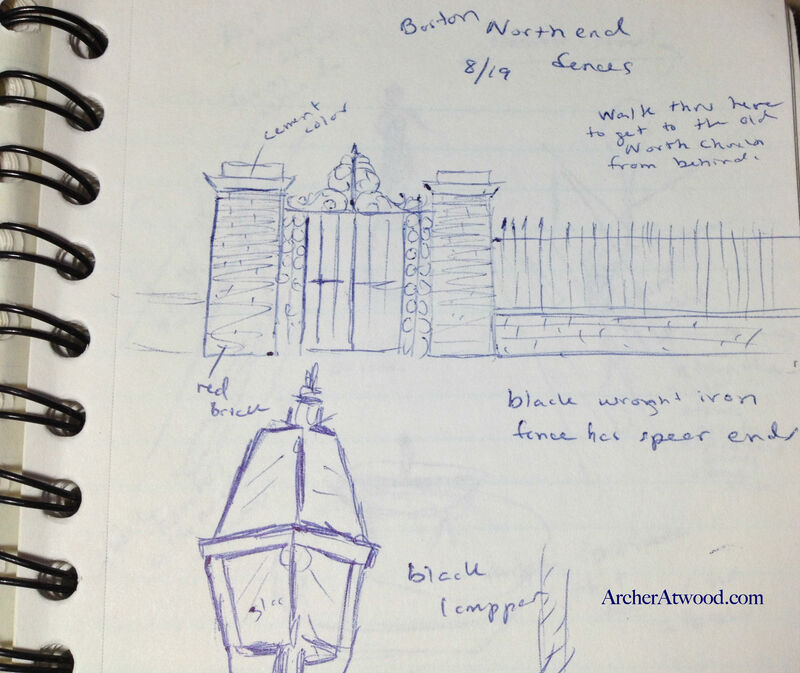 Carry that sketch journal/or smartphone notes with you everywhere you go. Even simple everyday occurrences record. Observe people in situations and how they react. Travel and observe and record everything that catches your eye! All this observing and recording will spark your imagination. 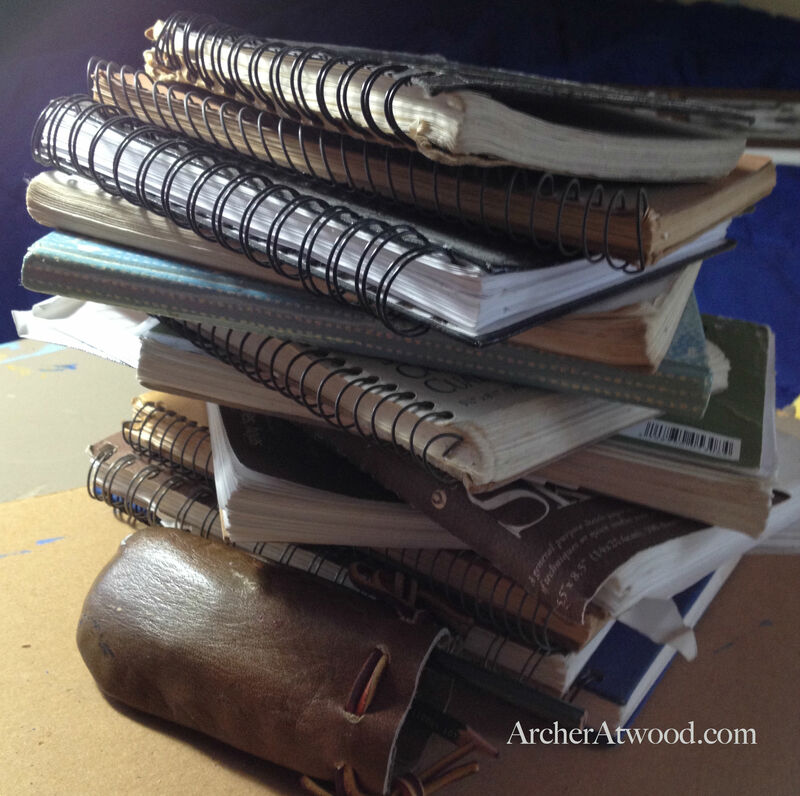 It will inspire you to move your story in ways you never thought of before. Also, it is way cool to read your own thoughts from years before. 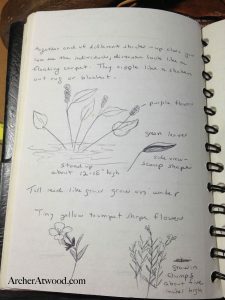 I had completely forgot about the dragonfly and the pond notes until I looked at those old journals for this article. They have indeed sparked a couple story ideas. Nice! 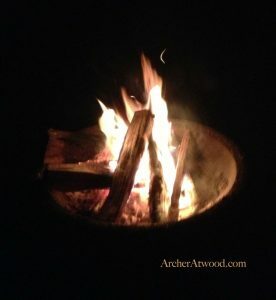 If you would like to comment, please head over to the Archer Atwood Books Facebook page and share your thoughts!